Flemish painter. He trained from 1625 to 1629 with Damiaan Wortelmans (b 1588/89) and Hans Biermans, both minor painters, and eventually, perhaps after spending some time abroad, became a master in the Antwerp Guild of St Luke in 1637-38. From at least 1651 he worked for Matthijs Musson, the Antwerp art dealer. From the considerable quantity of surviving works, it appears that he must have worked on a semi-industrial basis to supply the art market. The majority of his paintings are religious scenes, fairly small in size, often painted on copper and existing in more than one version (e.g. St Anthony of Padua Distributing Bread, London, National Gallery). Often they are copies or pastiches of compositions by Peter Paul Rubens, Anthony van Dyck or by history painters of the second rank, such as Gerard Seghers and Jan Boeckhorst. Van Herp also collaborated with other artists, such as Jacques d Arthois, Dirck van Delen, and David Teniers the Younger, painting staffage in their works. From Musson s business correspondence and from the great number of works by van Herp discovered in Spain in the 1970s, we know that many of these paintings were intended for Spanish buyers. 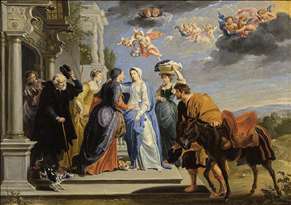 See more details about "The Visitation"